In this tutorial we discuss how Conditional Random Fields can be applied to knowledge base population tasks. 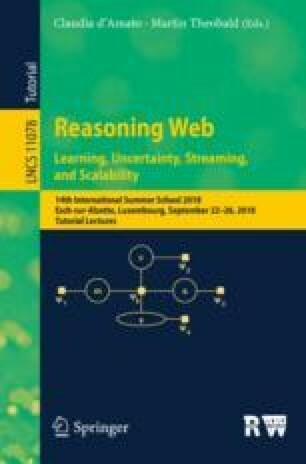 We are in particular interested in the cold-start setting which assumes as given an ontology that models classes and properties relevant for the domain of interest, and an empty knowledge base that needs to be populated from unstructured text. More specifically, cold-start knowledge base population consists in predicting semantic structures from an input document that instantiate classes and properties as defined in the ontology. Considering knowledge base population as structure prediction, we frame the task as a statistical inference problem which aims at predicting the most likely assignment to a set of ontologically grounded output variables given an input document. In order to model the conditional distribution of these output variables given the input variables derived from the text, we follow the approach adopted in Conditional Random Fields. We decompose the cold-start knowledge base population task into the specific problems of entity recognition, entity linking and slot-filling, and show how they can be modeled using Conditional Random Fields. This work has been funded by the Federal Ministry of Education and Research (BMBF, Germany) in the PSINK project (project number 031L0028A).